in one of the numerous beautiful evenings. Let the day finish in pleasant atmosphere and with excellent drinks. 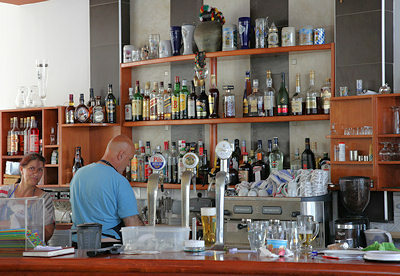 We offer you many delicious cocktails and longdrinks, different beers, wines, alcoholic and non-alcoholic drinks. Also you can get coffee (filter coffee, cappuccino, frappe and ice coffee) as well as pastries and different ice-cream cups. 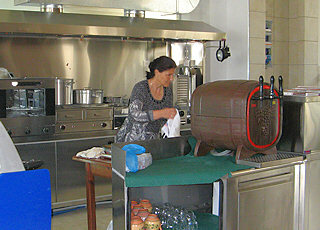 International and Greek beer of the barrel, also various bottled beer. Champagne cocktails, ice-cream cocktails, non-alcoholic cocktails. Cocktails with vodka, gin, rum, tequilla or brandy. Cognacs, whiskeys, ouzo, Pernod, Martini and liqueurs. Different wines (from the wine producers of the island). Different milk shakes and fruit juices. Also we offer different dishes! 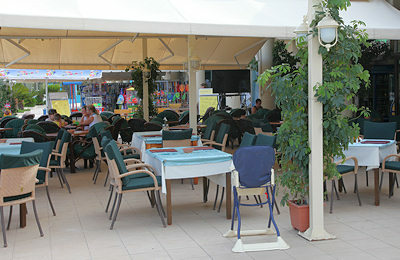 pasta dishes as well as many Greek specialties (like mousakka, gyros and souvlaki). Esperos Village, Colossos, Palladium Alilia and Elysium - only a few minutes by feet!